Mordian 7th Regiment: Heresy Era Thousand Sons - Spireguard Stormhammer painting begins! Heresy Era Thousand Sons - Spireguard Stormhammer painting begins! With the sweet new transfers from Fallout Hobbies arriving, it galvanized me to work on a model to put 'em on! 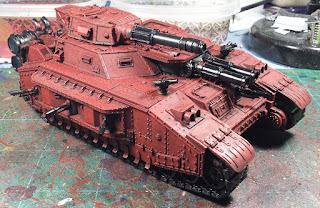 The centerpiece for the Spireguard army is going to be the Stormhammer I'd picked up at Gencon, and I managed to get the reds laid in over the last few days. So far, so good! Next up will be all the silver metallics, after which I can start in on the detail panels in bone-white, and gold rivets. ...So many gold rivets. Hoo boy. Damn mate - that thing is beastly sexi! Now I have to got to get one of those! Nice model, will you use the leviathan army list, make a mega armi for it to fit in or just use the unbound armies rule? Ohh now that is a fun tank. No idea on the rules but I love the WW1/grim dark crossover look of it. Glad to see you are back into the swing of things. Always love your tanks! Can't wait for the updates on this one! @Dai: I am thrilled with FW's take on the beast - it's at once sleek, but brutal. @Francesc: The basic Imperial Army list in Tempest provides for the inclusion of a single Lord of War, which is nice! @Davetaylor: Thanks very much - I'd love to see what your version of a Stormhammer would look like! @Rory Priest: Indeed! Feels good to be back behind the painting table again! @Greg Hess: Cheers man - plenty to come over the next week or two! @#2501: You know, that's exactly what I was thinking - it's got a bit of a naval gun-deck look about it. Such a cool kit! That twin barreled battle cannon on the front is pure win. Love it. 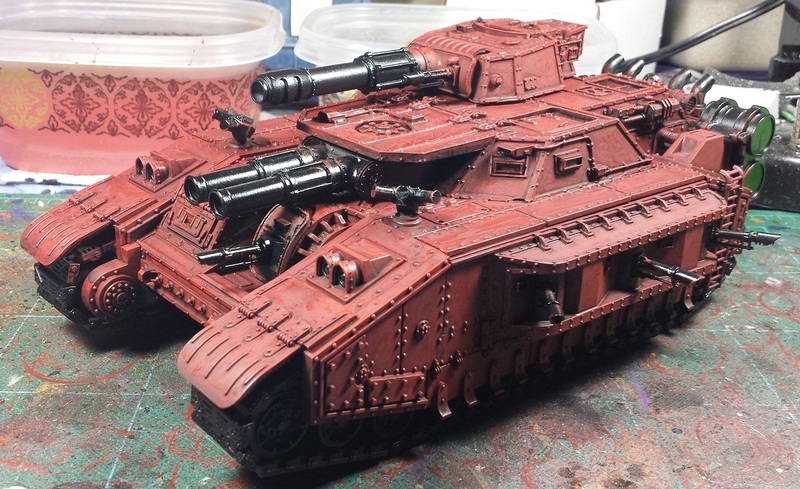 Is it still built of the stock Baneblade chassis or does it have its own bespoke base to build up from? @Frothing Muppet: Totally! It uses the plastic baneblade track housings and undercarriage, pretty much the rest is all resin. It's a beast! @Miniature Tim: You know it, brother! Hah!